Every time our chefs step into our test kitchen, they follow whatâ€™s essentially a culinary checklist. When a Tovala Meal ticks each of these five crucial boxes, they know theyâ€™ve created something good! Basically, what this means for you is you end up with food that tastes fantastic, delivers on nutrition, and transforms your plate (or bowl) into something photo-worthy! Take our Italian Sausage Meatballs with Cauliflower Rice, Roasted Peppers & Giardiniera. Itâ€™s a deconstructed meatball sandwich, which means you can forgo the makeshift napkin bib. Youâ€™ll still experience that comfort food feel of hearty meatballs and tomato sauce. But this time, enjoy them over a bed of cauliflower rice and roasted bell peppers. 1. Nutritionally Well-Rounded: They contain 50 grams of protein, 40 grams of carbs, and 21 grams of fat for an all-around filling meal. 2. Between 400-800 Calories: Theyâ€™re only 530 calories, or with giardiniera on top, 630 calories. 3. Colorful & Visually Appealing: Red, green, and orange peppers and our lovely red marinara pop against the gentle white of the cauliflower rice and melted parmesan. 4. Big & Bold Flavors: The meatballs themselves are made of ground pork and seasoned with chili flakes, basil, oregano, and garlic. A layer of parmesan cheese cooks on top to form a bubbly, crispy cheese topping for extra meaty, melty greatness. Then add giardiniera (Chicagoâ€™s favorite bright, punchy pickled pepper topping) to give everything a lift. 5. 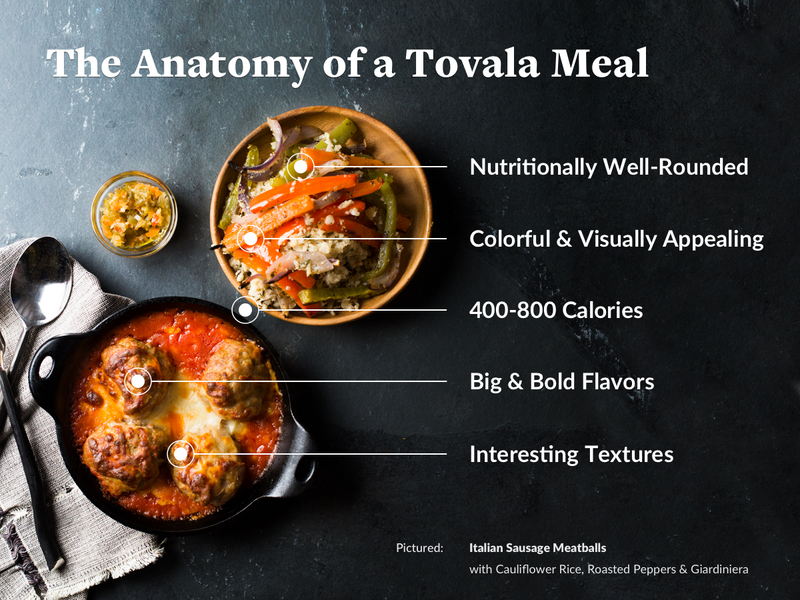 Interesting Textures: Every bite of your entree combines the crunch of giardiniera, firm but springy bites of meatball with bright, herbaceous marinara, and a lovely trail of parmesan cheese. Enjoy bites on the side of roasted peppers and cauliflower rice for the contrast between the grain-like cauliflower and the crisp veggies. But really, you should try these meatballs for yourself and see if they deliver on these five fronts for you! Check out Italian Sausage Meatballs and the other meals you can order this week.